Paula: Paguei R$ 45,00 ao Júlio pelo livro, mas o preço certo era R$ 30,00. Cris: Então o Júlio enganou você? Paula: Não, eu é que me enganei e mandei o valor errado para ele. Paula: I paid R$ 45,00 to Júlio for the book, but the price was R$ 30,00. Cris: So Júlio deceived you? Paula: No, I made a mistake and sent him the wrong amount. As shown above, Enganar means to deceive someone and it also means to make a mistake. The trick is to use it in the correct form to express what you want. I will show you how to use the verb Enganar with confidence. Enganar is a regular verb. O João disse que não podia ir à festa de aniversário da Ana, mas depois apareceu lá de surpresa. Ele enganou todo mundo porque queria fazer essa surpresa. = João said that he couldn’t come to Ana’s birthday party, but then he showed up by surprise. He fooled everyone because he wanted to surprise us. Não confio no Tiago. Ele mente muito e está sempre enganando todo mundo. = I don’t trust Tiago. He lies a lot and is always deceiving everyone. Use the verb Enganar in the past participle with the verb Ser to say that someone is being deceived or was deceived by someone else. Carlos comprou um carro usado, mas não foi um bom negócio. Ele pagou demais por um carro cheio de problemas. Ele foi enganado pelo vendedor. = Carlos bought a used car, but it wasn’t a good deal. He paid too much for a car that is full of problems. He was fooled by the seller. Não seja enganado pela mídia! Pesquise as informações em fontes diferentes. = Don’t be fooled by the media! Research information from different sources. When you use the verb Enganar as a Reflexive Verb, it means: to make a mistake, to be wrong. Carla: Tá maluca? Meu aniversário é daqui a três meses. Joana: Poxa, foi mal. Eu me enganei. Carla: Are you crazy? My birthday is in three months. Joana: Oops, my bad. I made a mistake. Ângela não confia no Pedro e ela nunca se engana com as pessoas. = Ângela doesn’t like Pedro and she is never wrong about people. We use the verb Enganar in the past participle with the verb Estar to say that someone is wrong. Eu pensei que Mirela morava em uma casa, mas ela mora em apartamento. Eu estava enganado. = I thought that Mirela lived in a house, but she lives in a condo. I was wrong. James não é americano. Você está enganada. Ele é canadense. = James isn’t American. You’re wrong. He is Canadian. Engano is a masculine noun. It means: a mistake. Notice that the literal translation of Fazer is to make. But we don’t say “fazer um engano”. In Portuguese we say: cometer um engano. Cometi um engano! Enviei o relatório de vendas para o cliente quando deveria ter enviado para o meu chefe. = I made a mistake! I sent the sales report to the client when I should have sent it to my boss. Errar é humano. Todos nós cometemos enganos na vida. = To err is human. We all make mistakes in life. 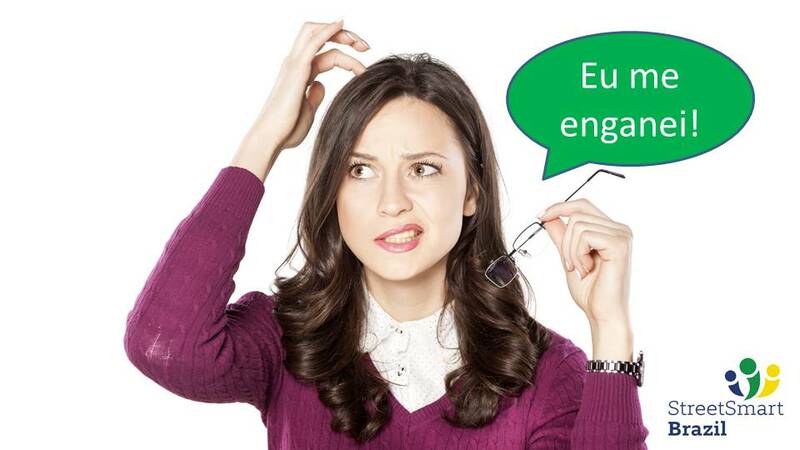 To use the verb Enganar with confidence, practice with your Portuguese teacher and use the verb in real life examples. Não se engane! (Don’t fool yourself!). We all need lots of practice to speak a foreign language with ease. 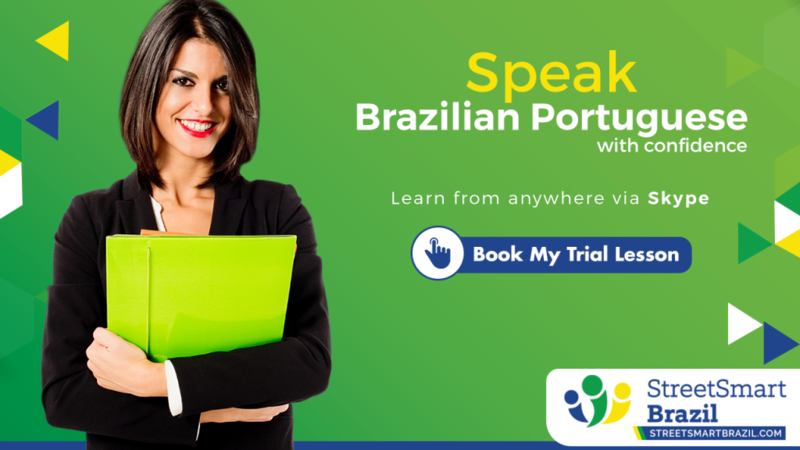 Street Smart Brazil offers one-on-one lessons via Skype. Book a Trial Lesson with one of our amazing teachers to see the benefits of learning with a friendly and professional tutor. 1. Ele foi enganado por ela. He was deceived by her. When Enganhar is used reflexively how can I tell the difference, context? You know the different meanings of Enganar by how the verb is used. In your first example, you are using it with the verb Ser. In the second example, you have the verb Estar. These different verbs confer different meanings to Enganar. In your second example, it should be enganada, in the feminine.